What do you call two smart, spunky, funny women who create a cannabis farm and deal with a saturated recreational market by moving to other areas, mainly the immensely useful and marketable realm of hemp and, oh, btw, have a lot to say about sexism in the male-dominated world of ganja? You call them Ebb & Flow. That’s the name of their farm, thriving off North Valley View near Ashland. Amy Parscal and Lisa Denney came up with the name while doing Medicine Cards one night. The Ebb & Flow card came up over and over, and they noted: Isn’t the world all about that great cycle? You’re flush, then you’re lean. It’s winter, then summer. It’s not going to be flush all the time, like the Oregon pot market was in the dizzying months after legalization. Who could not have predicted the flood of bud would satiate demand (and drop prices) in the harvest of September 2017? 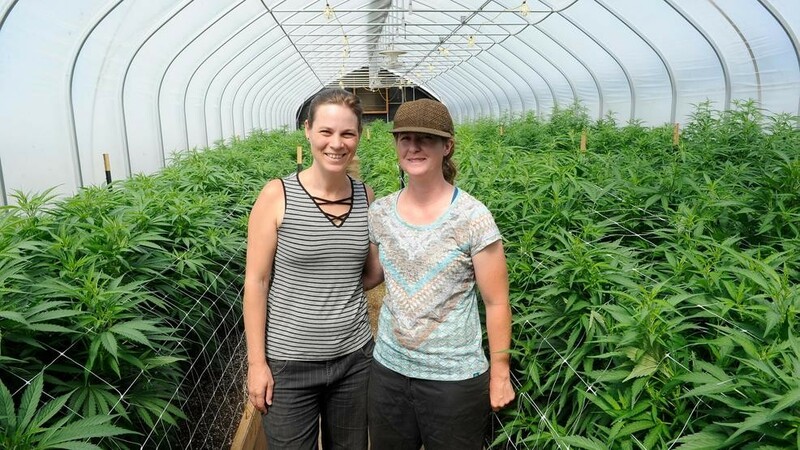 Parscal and Denney researched and selected the best cultivars and branched out as the Cascade Hemp Collective, selling vast batches of hemp starts. During a recent visit to the farm, plant starts were getting loaded into a big truck as Denney double-high-fived the buyer, both celebrating this thriving new market. The women have been growers for 10 years. They met at a New Year’s Eve party in San Francisco in 2003, in their 20s, “a full connection instantly, a really great fit” on a range of common values and passions, says Denney, starting with permaculture, which is a model not just for growing plants, but for the planet and life itself. They moved to the hamlet of Big Bend, between Mount Shasta and Mount Lassen, lived off the grid and started growing medical weed. There they met Eviane Coton and Paul von Hartmann, who are still partner-managers in the business. Shasta County banned outdoor grows (and they got tired of living off the grid), so the pair bought 160 acres in the Cascades east of Ashland, then, with legalization of recreational, moved to 10 acres just outside of Ashland. Imbued in all this is a deep and unabashed love for Earth. “Outdoor is Gaia-therapeutic and indoor is Gaia-cidal,” von Hartmann says. The women look at themselves as scientists as much as farmers. With their shift to hemp, they are partnering with other growers in the Cascade Collective and are engaged in genetic research, increasing quality and using volume sales of hemp to pay for it, says Parscal. A full-spectrum healing oil, which they call Herba Prima, has emerged from this. “To survive in this industry, you need to diversity,” Parscal says. Coton calls for a spirit of “co-creation and collaboration, not competition” in the business, and part of that is addressing its sexism or, as Denney calls it, the “bro-culture” of the industry. “I feel I’m a pretty quiet person, but I have to yell to be heard and respected,” says Denney.